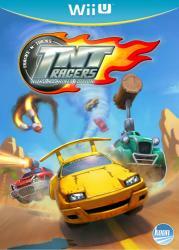 TNT Racers is a fun multiplayer game combining fast and exciting racing action with extra brand new features. The Shadow Race feature lets every player stay in the race even if a driver is clearly being outdriven. But the best things are the cool pick-ups which can ultimately decide if you win or lose. The exclusive �Nitro Machines Edition� features some unreleased content, including brand new cars, additional tracks, compelling challenges and game modes. Upload your highscore and compare with your friends in the online rankings. Be careful with this explosive mixture - it is highly addictive.